What greater earthly reward is there than serving pets and people? We are always glad to accept resumes from dependable, enthusiastic, hard working, honest, team oriented people who wish to join our team of veterinary health care professionals. The Animal Dentistry and Oral Surgery Specialists, LLC is a specialty practice and our services and staff are held to the highest standards of the veterinary profession. If you posess these qualities and wish to work with others that do, please consider our employment opportunities. Individuals that are well organized, think and communicate well are highly encouraged for this position. Responsibilities include e-mail and telephone correspondence, computer operation, practice marketing, scheduling appointments, setting up new clients and patients, preparation and maintenance of medical records, admitting and discharging patients, filling prescriptions, financial transactions, retail sales, filing, as well as front office and reception area maintenance. Receptionists will assume the responsibility for acquiring the medical and legal information necessary for the performance of our operations. If you love animals and helping people, this position may be right for you. 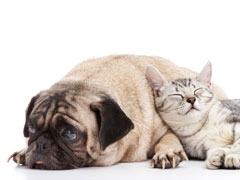 The certified veterinary technician is fundamental to the delivery of our services. If you wish to have your skills well utilized and appreciated, a position at the Animal Dentistry and Oral Surgery Specialists, LLC may be an excellent opportunity for you! Here is your Opportunity to contribute within our specialty dentistry and oral surgery service. CVT is directly responsible for Client Satisfaction and Patient Care. The successful CVT candidate will have responsibility for Practice marketing (Website, facebook, Pinterest and Twitter), direct communication with staff of other veterinary practices and help in providing” dental education". Technicians are responsible for anesthesia, patient monitoring and post-operative care using the most sophisticated equipment available to the veterinary profession. Technicians assist the doctors with client and referral veterinarian communications. They assist in dental procedures, oral surgery, nursing care, medical and laboratory procedures, pharmacy management and radiology. Technicians are involved in equipment and hospital maintenance/operation, inventory management (medication logs) and the maintenance of the OSHA and Hazardous Materials programs. Respectful working Environment where the successful candidate is appreciated, respected and well utilized. Your ideas are considered and implemented. Competitive hourly wages, Continuing education, Health Insurance, Paid vacation, Retirement plan and Pet dental, medical and surgical care. The compensation package will be based on successful candidate’s needs. If you help improve the delivery of our services, you will share in the financial benefits and the professional satisfaction from our services. Real rewards for enthusiastic effort! What are your expectations? Resumes accepted for immediate consideration! The Veterinary Assistant position is new to the Animal Dentistry and Oral Surgery Specialists, LLC. Interested individuals must be willing and able to learn. The veterinarian assistant will assist doctors, technicians, receptionists and clients. Individuals with interest or experience in photography, image manipulation and computer operation are needed. If you enjoy working with others to help people and their pets, this position may be right for you. Assistants are responsible for general cleaning, laundry, waste disposal, and setting up laboratory work.